QBE Insurance Group is one of the world’s top 20 general insurance with operations in all the key insurance markets. Facilitate was appointed as the project manager to oversee the entire real estate portfolio and roll out all QBE’s offices Australia wide. The national brief included overseeing the execution of a full workplace strategy and the creation of a new global headquarters for the QBE Group, in addition to offices in Melbourne, Paramatta, Newcastle, Adelaide, and Perth. Facilitate looked after the office real estate portfolio that were collectively in excess of $100 million. 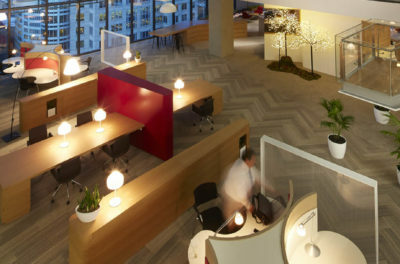 The global headquarters in Sydney won the 2014 MBA Award Winner: Interior Fitouts $7.5- $10million. 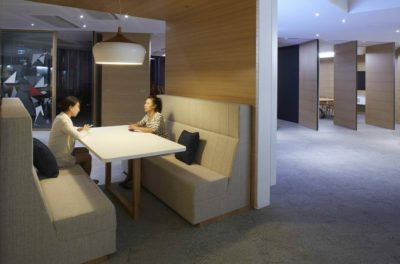 The building of the new HQ was designed by an international architect in Sydney, and integrated a large void running through four levels to create a ‘village’ feel, providing a unique and innovative space for QBE. Facilitate also coordinated all essential services for the building including AV equipment and air conditioning which were built within the feature ceilings. The close monitoring of budget and constant alignment with design detailing and material selection ensured these projects was delivered under budget. The close monitoring of budget and constant alignment with design detailing and material selection ensured these projects was delivered under budget. Just thought I would let you know that we are now into full swing in 2015 and as busy as ever. Our new home here is fabulous and our staff engagement has improved significantly ... much of which can be attributed to this facility. Whilst our CEO publicly expressed his thanks to you at the opening, I would like to convey my personal appreciation for your efforts. It was a great team job that was well planned and cohesive in its execution, with not a detail missed. Thank you for leading this effort and being there whenever required.